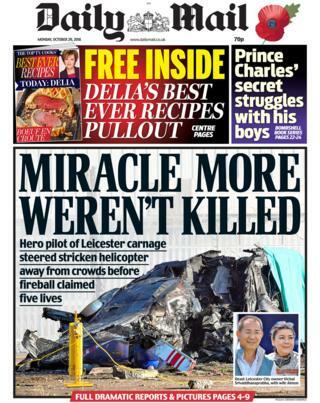 The Daily Mail reports helicopter pilot Eric Swaffer saved lives by steering the helicopter, carrying Leicester City chairman Vichai Srivaddhanaprabha, away from crowds before it crashed. The crash killed all five people on board. 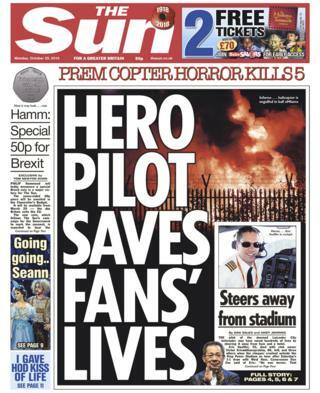 The Sun also reports that the pilot of the Leicester City chairman’s helicopter saved “fans’ lives”, saying he steered it away from fans and a hotel. 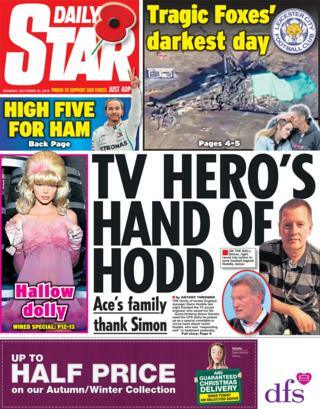 Cameraman Dan Cox called Mr Swaffer “heroic”. The i says Leicester is “in mourning” after the Thai owner of the club died. It adds that fans have flocked to the King Power Stadium to pay tribute to Mr Srivaddhanaprabha. 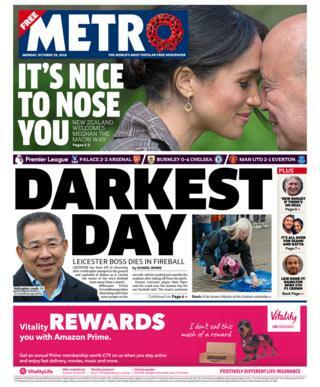 The Metro reports on Leicester City’s “darkest day”. Billionaire Vichai Srivaddhanaprabha died along with two members of his staff, the pilot and another passenger after taking off from the King Power Stadium. 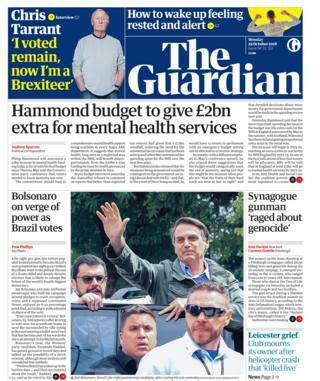 The Guardian reports Chancellor Philip Hammond is set to announce a £2bn increase in mental health funding as part of Monday’s budget. It says the commitment “should lead to comprehensive mental health support being available in every major A&E department”. 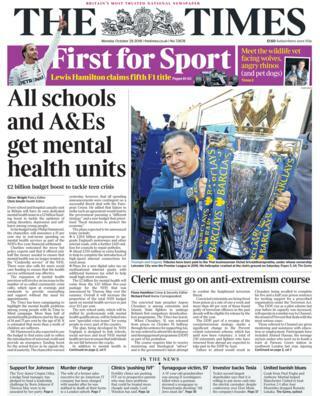 The Times says the £2bn to mental health funding will help “tackle the epidemic of eating disorders, depression and self-harm among young people”. 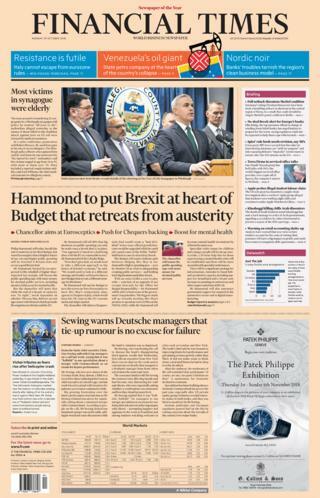 The Financial Times also leads on Monday’s budget, saying the chancellor will “herald the end of austerity in his third budget”, but will warn Brexiteers “a brighter future of tax cuts and higher public spending will be wrecked if Britain does not secure a good Brexit deal”. About 500 people in England and Wales die as a result of complications caused by diabetes every week, the Daily Express reports. The paper says causes of death include heart disease, stroke or amputations “which could have been avoided if patients were supported to manage their condition effectively”. 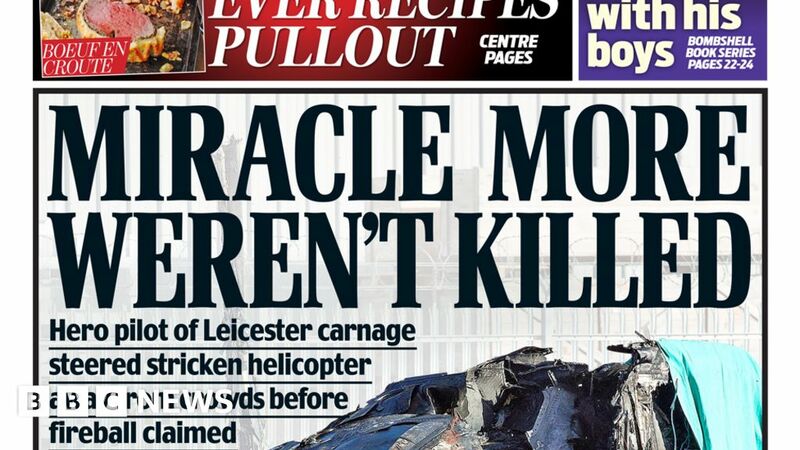 The Leicester City helicopter crash is the lead for many of the country’s newspapers. 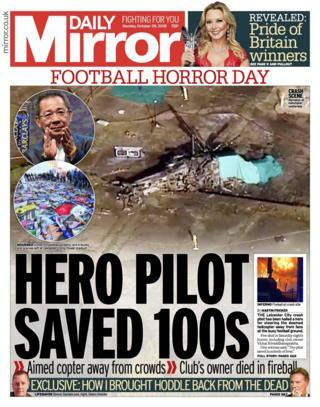 While they reflect the mourning and tributes for Vichai Srivaddhanaprabha elsewhere in their coverage, it’s the pilot who is feted on the front pages. 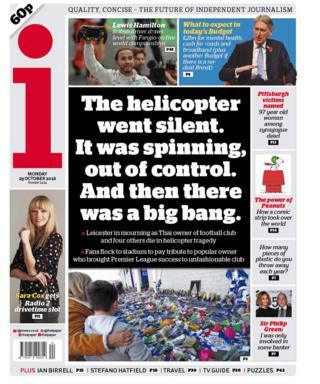 The Sun says Eric Swaffer may have saved hundreds of lives by steering the helicopter away from the stadium and a hotel packed with Saturday night revellers. The Daily Mirror reports that more than a thousand staff, corporate guests and media were still inside the ground at the time of the accident. As the Chancellor prepares to deliver his Budget, the question for many is how far he will loosen the public purse strings. The Financial Times says the Budget will tread a delicate path between obliging Mrs May in her demand for higher spending, and holding back big decisions until after Brexit. The Sun reports that Mr Hammond will announce a special Brexit coin, a 50p piece available from the day the UK leaves the EU next March. The paper, which has been campaigning for the government to mark Britain’s departure with a coin, says it will bear the words “Friendship with all nations”. Its leader column castigates Royal Mail for refusing to release a Brexit stamp, saying it did so to commemorate Britain’s membership of the EEC in 1973 and the Single Market in 1992. 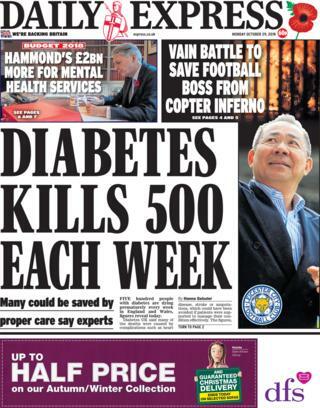 The Daily Express leads on figures by Diabetes UK showing that 500 people with the condition are dying prematurely every week in England and Wales. The paper reports that many of the deaths are caused by heart disease, stroke or amputations, which could have been avoided if patients were supported to manage their condition effectively. With the right treatment, ranging from insulin injections to diet management, diabetics can live long, healthy lives, it says. Finally, a number of papers report the findings of a study showing that the average person throws away 4,490 pieces of plastic every year. The Mirror says campaigner Daniel Webb stored all the plastic waste he threw in the bin for a year and calculated that across the UK, we collectively throw away 295 billion pieces. The Sun says he and a fellow campaigner, Dr Julie Schneider, found that 93% was single-use packaging and 70% was not currently recyclable. Has starvation become a weapon of war?